In 1962 I was approached by Bunny Joyce who asked me to join his band, The Emerald. The band, which had been on the road since 1955, were short of a bass player so I agreed to give it a go and Bunny was able to procure a bass guitar for me. 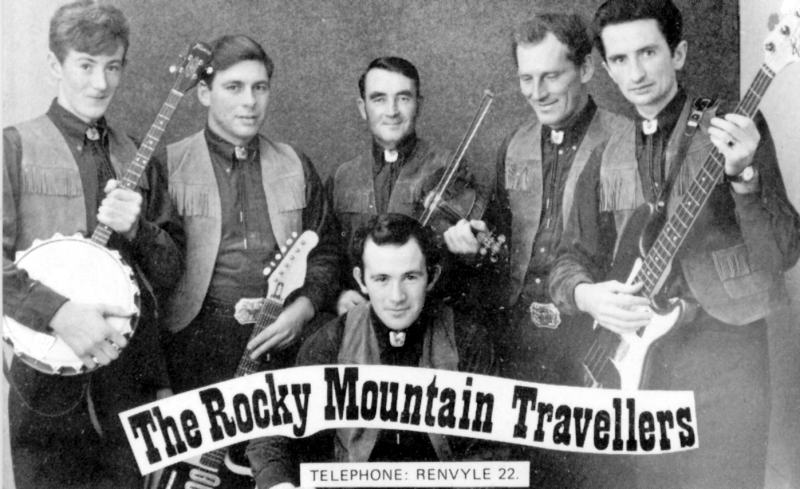 In 1963 we renamed the band The Mystic Aces and later in 1968 the name was changed again to The Rocky Mountain Travellers in an attempt to give it more of a country kind of flavour. I played in the band until 1970 and we had many great times. We played all the local dancehalls in West Connemara on a regular basis, Tullycross, Letterfrack, Clifden, Ballyconneely, Roundstone, Recess and Leenane. We were usually playing three times a week but his could increase to four or five nights during the summer season. The two biggest nights of the week were always Friday and Sunday and, of course, there were never any dances held on a Saturday night on account of the Sabbath. We were usually paid about £25 between the five of us. There were many other small bands like ourselves from the west of Ireland who travelled around playing to small crowds in small dancehalls. These included Quicksilver from Galway; Pat Friel and his band from Westport; Basil Moran and The Beat Minstrels from Louisburg; Mick Cummins and the Blue Notes from Letterfrack; and the Kingstown band. It is very difficult to say which venue gave me the greatest satisfaction but at that time Ulick’s Hall in Letterfrack was generally regarded as being the best hall in West Connemara for a dance. It was probably the right size and there was always a lovely atmosphere because the lighting was just right and there was always a good crowd. There was usually a good mix also with people coming from Clifden, Ballyconneely, Roundstone, Cleggan, Letterfrack and Renvyle. There was very rarely if ever a bad dance in Ulick’s. Rows were common enough especially around Christmas. One never stopped playing when a row started. Indeed, that was when one played for all one was worth in order to keep attention off the row and stop everybody from converging on it. Remembered by Michael O’ Neill and written by Paul Gannon.